Do you need wedding attire tips and advice about second wedding dresses because you are a second time bride? Where can you find wedding dresses for a second marriage? If you are considered a mature bride is there anything you should or shouldn't wear for your wedding? These questions are just a few of the frequently asked questions brides have about choosing a wedding dress for second marriages. The answers to these questions as well as others are answered here. What styles are considered appropriate bridal dresses for a second wedding? As far as wedding attire etiquette goes . 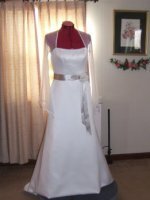 . . you can choose to wear any style wedding dress you want. These days there are “very few” hard fast rules regarding a second marriage bridal gown. Sometimes you will get a lot of advice based on old etiquette rules. Need some advice on what to do? Go to wedding attire etiquette FAQ for advice on how to handle family members who may be holding on to old etiquette rules. Is it okay to wear “white” when it comes to second time wedding dresses? Absolutely! “The color white” doesn't mean the same thing it once did with regards weddings. Long gone are the days where you were told you can’t wear white. Now you can wear whatever color you choose for a second wedding dress. It is hard to believe but . . . even the colors red and black are okay for wedding dresses these days. on my second wedding dress? Yes you can. But . . . some etiquette experts say that second time brides usually shouldn’t wear an elaborate train like a first time bride. For second wedding dresses the train should be shorter in length . . . if you choose to have one at all. But of course you make the decision about this. If you are a bride who did not have a traditional wedding the first time, it is perfectly fine for you to choose to have the dress of your dreams the second time around, long wedding dress train and all. Can I wear a veil? But you know . . . most brides marrying for the first time don’t wear the veil over their faces anymore. Most brides want their faces clearly seen at all times. So this is a tradition that is fading away. I am looking for advice on finding wedding dresses for a mature bride. Can you give me some tips? Most brides looking for wedding gowns for second marriages also happen to be older brides. 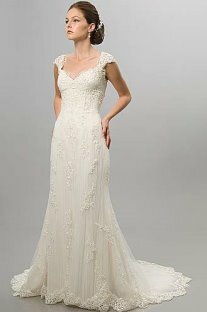 And as you may have found it can be challenging to find age appropriate styles of wedding dresses for older brides. There is a whole section devoted to helping the mature bride with tips and advice. For those mature brides who prefer wedding dresses with sleeves, here are some suggestions. Can I wear a simple wedding dress or a wedding suit? If you are looking for a simple wedding dress for your wedding read these this advice. If your wedding is informal and you would prefer a wedding suit here are some tips on picking a suit. Of course the bridal shop will have styles that range from formal wedding gowns to informal wedding dresses. Where can I find a second wedding dress at affordable prices? Try ordering bridesmaids dresses. Some designers like Mary’s Bridals and Forever Yours bridesmaids dresses can be ordered in white or ivory. It’s easier than you might think to find affordable second wedding gowns. Which wedding dress designers have affordable wedding gowns? Here are a few to get you started. What if you need an informal dress or casual dresses for a second wedding? Which retailers can you try? J Crew has informal wedding dresses and special occasion dresses that can be used for casual informal wedding dresses. Macy's sells very informal wedding dresses at bargain prices. Go to their wedding shop section on the website. You will find informal wedding dresses and wedding attire for the whole bridal party at reasonable prices. Remember if you see a gown you want from your favorite store, you probably want to order right away. Since they are limited on their stock. Sale prices don't last long. Usually department store return policies are better than bridal shop. Read the return policy before ordering. For more information about planning second weddings theknot.com has a whole section about this.